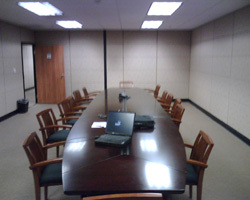 The Brand Boulevard Court Reporting Center is situated in the crux of the downtown Glendale litigation districton. Situated just off of the 5 and 134 freeways, the center is centrally located between downtown Los Angeles, Pasadena and Burbank. Step inside to find an upscale, modern lobby and reception area; deposition rooms with advanced audio-visual equipment and state-of-the-art videoconferencing take the hassle out of planning on-site depositions. A friendly, highly trained staff is on hand to provide a multitude of litigation support services on an as-needed basis.